In order to get the most skin loving properties out of said bundle I infused the lavender buds in olive oil and used a lavender tea for my lye solution. Now, I didn’t have a lot of that precious lavender on hand, so I made a small one pound batch. But I trust that you have a lot more lavender buds to your disposal either by growing it yourself or by buying some. That’s why I resized the batch to the more standard 3 pounds. 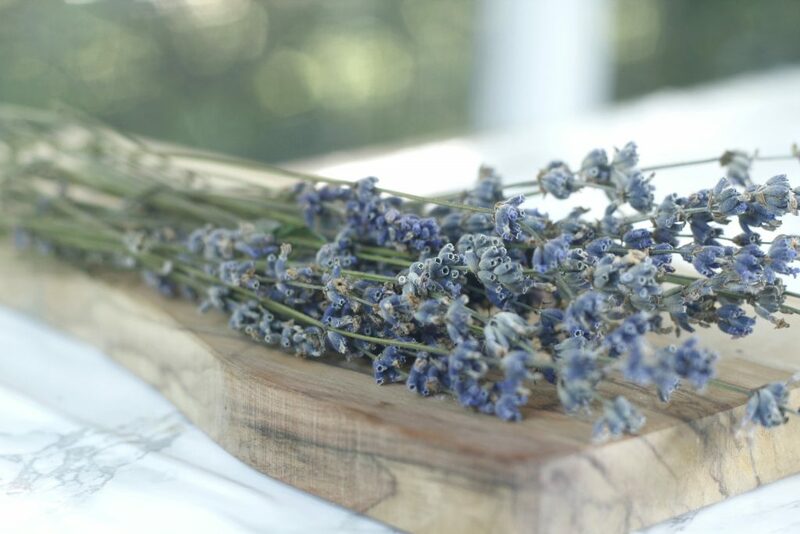 Sadly, infusing lavender in oil or steeping it in water is not enough to carry any of the calming lavender scent over. 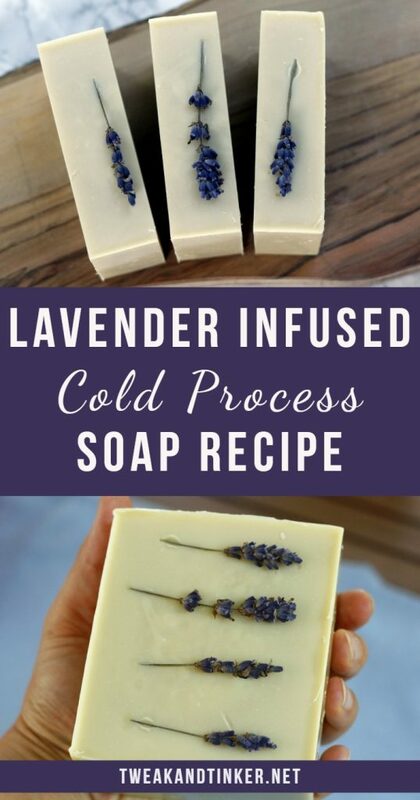 In my experience, lavender essential oil seems to be a rather fleeting scent in cold process soap. That’s why I added a tad bit of patchouli to anchor the lavender scent. Don’t worry, this won’t turn into a hippy dippy sort of a smell, the lavender will still dominate the blend. 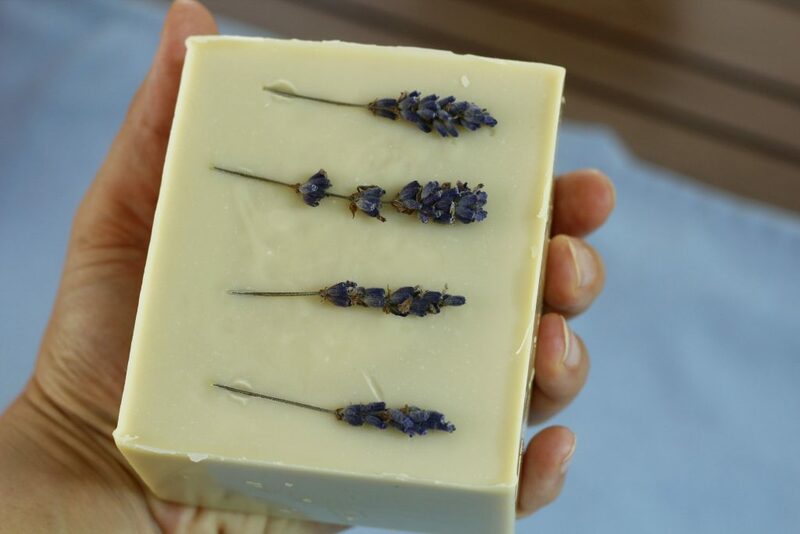 This soap packs a triple punch or lavender goodness and it turned out so creamy and soothing. I’ll stop yapping now, so we can dive into the recipe. Let’s go! 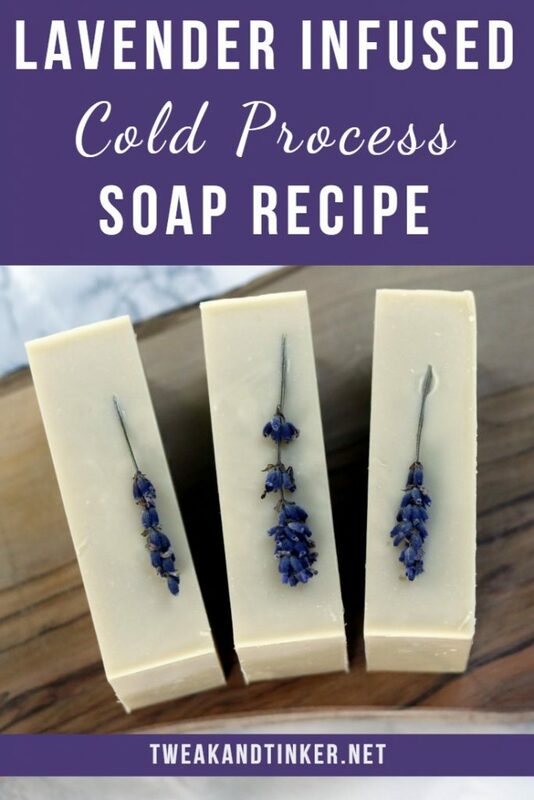 I you’ve never made cold process soap before, make sure to check out my posts on lye safety, my beginner’s tutorial and list of equipment needed. Disclaimer: This post may contain affiliate links, meaning at no additional cost to you, will I earn a commission if you click through and make a purchase. There are two ways to infuse dry herbs or flowers into oil: Cold or heat infusion. Both methods start with combining plant material with oil in an airtight container (preferably made out of glass). b) fill a saucepan with a couple of inches of water, stand your mason jar in it, put it on a very low simmer for 2-3 hours. For this you will have to check on your oil frequently and make sure the water hasn’t evaporated. 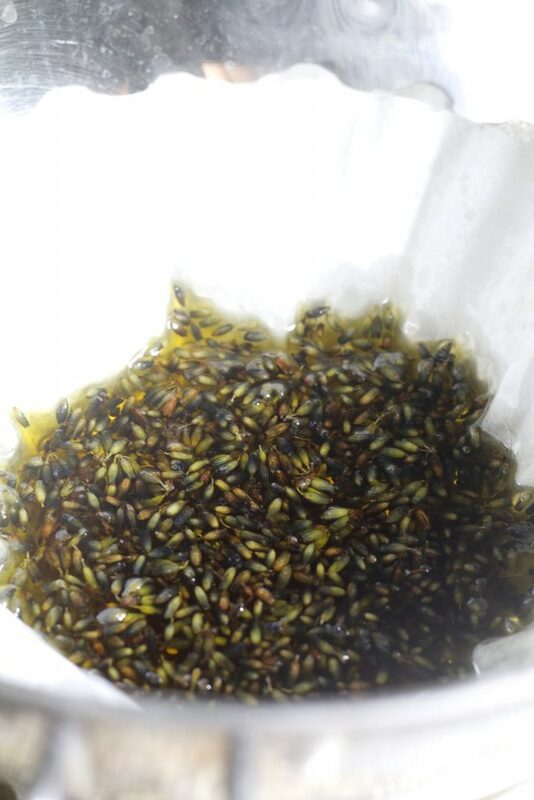 After the lavender is done infusing the oil, it’s time to strain the lavender buds. I used a colander that I lined with a coffee filter, but you can use a cheese cloth or very fine sifter instead. Note: I only recommend infusing DRY plant material into oil. The water content of fresh herbs and flowers is too high and will overtime lead to mold and a very bad smell. Don’t even ask how I found that out 😉 So, if you grow your own lavender at home, make sure you dry it hanging upside down in a dry, cool and dark place for at least 2 weeks. This recipe will yield around 42 oz of soap (8 average sized bars), you can resize the recipe to your heart’s desire using a lye calculator. It is always a good idea to run every recipe you find online (including this one) through a lye calculator, just to be safe. This recipe uses a superfat of 6% and a 38% lye concentration (this, I find, really keeps the soda ash monsters at bay). Slowly and carefully add the lye, gently stirring until fully dissolved. 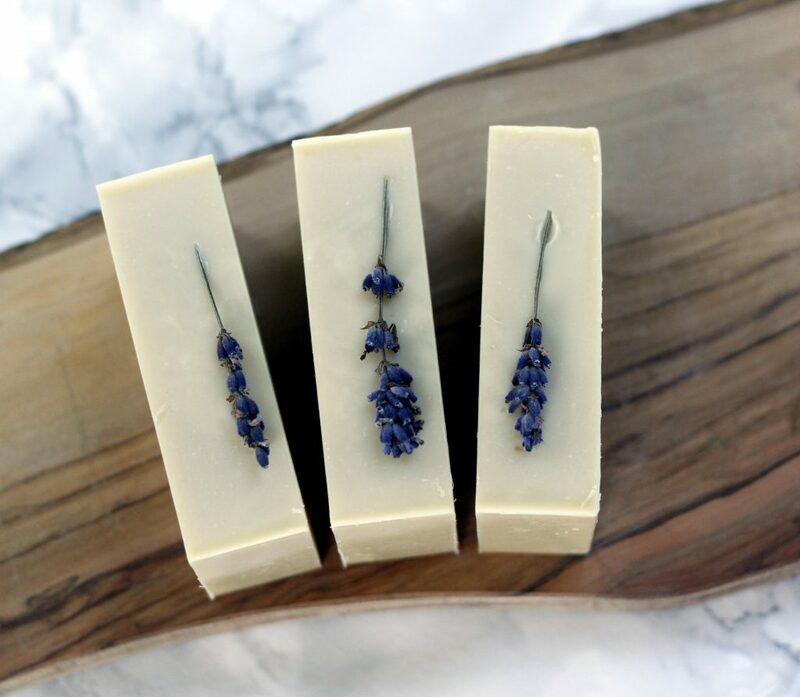 If you wish to decorate the top with lavender twigs or buds, make sure that the soap is at VERY thick consistency at that point. For me that was 10 minutes after I poured the soap. 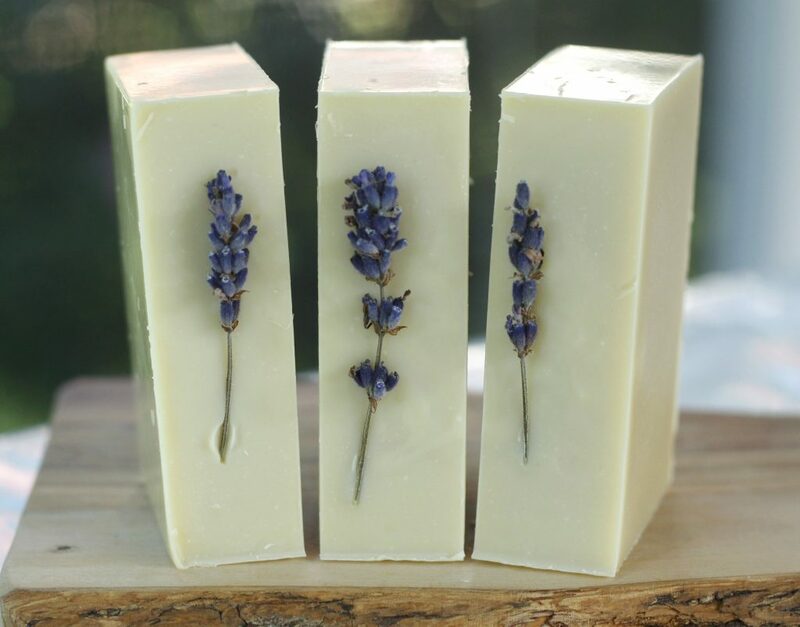 This will prevent them from leaving brown marks on the top of your soap. 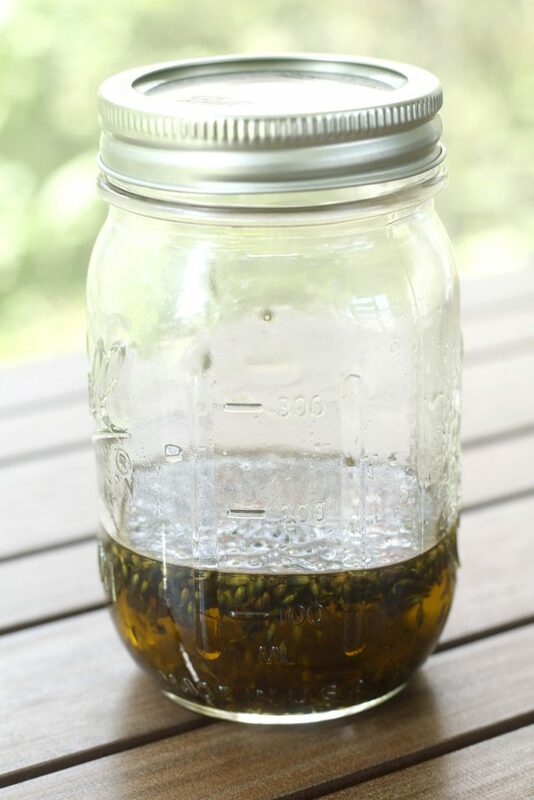 Can I just use plain olive oil instead of infusing it? And if I do, would the amount of olive oil be the same whether it’s infused or not? Thank you!! 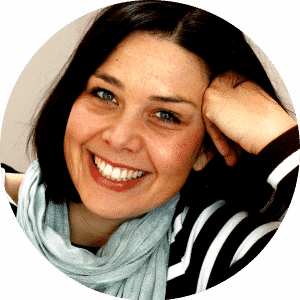 Hi Rachel, you can absolutely do this recipe without infusing the oil. The amount of oil will be the same. Happy Tinkering!